A couple of years back, when I still had lots of leisure time to read, I was in a book club with two of my dearest friends. Whenever we would get together to discuss what we had just read I would cook a meal inspired by the book. After reading Ken Kesey’s Sometimes a Great Notion we got together and spooned venison stew over tall butter-studded biscuits and watched Paul Newman and Henry Fonda play the Stamper men on my ancient TV and they urged me to start writing about my literature-inspired recipes. A few days later Yummy Books came to be and it is because of that that Kesey’s novel holds a particularly special place in my heart. Kesey is best known for One Flew Over the Cuckoo’s Nest, but in my opinion Sometimes a Great Notion is his real masterpiece. The novel takes place in the fictional Oregon town of Wakonda and chronicles the lives of the Stamper family—the only non-union logging family left in the town. When the unionized loggers go on strike to demand more pay (their hours are being cut due to the invention of the chainsaw) the Stamper family decides to cross picket lines and single-handedly provide the mills with lumber. All of the chaos outside of the Stamper household is nothing, however, compared to what is going on on the inside. Sometimes a Great Notion is a sprawling epic complete with deep-seated brotherly hatred, savage revenge plots, repressed silences and Oedipal lust. Think Steinbeck’s East of Eden pumped full of testosterone. There is hardly a bleaker, more raw look into family dysfunction and hard-headed stubbornness. The only moments of relief from the constant stream of heartache and cold beating rain come when the Stamper family is gathered around the table. 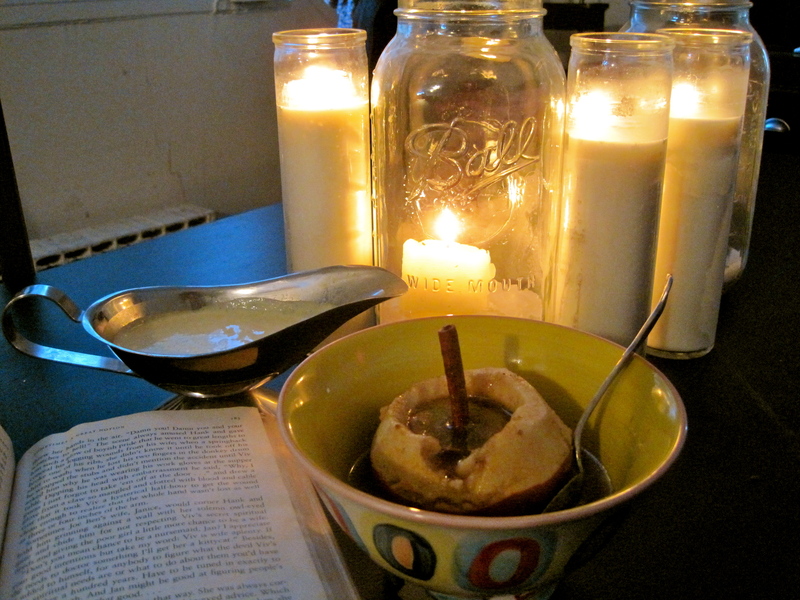 For dessert baked apples were waiting. Viv had prepared the apples by coring them and filling the holes with brown sugar and cinnamon Red Hots, then topping each apple with a slide of butter before she put them in to bake. During the meal the kitchen had been filled with the spicy smell of their cooking and all the kids had squealed delightedly when she brought the square pyrex dish from the oven. ‘Hot, now, watch it.’ The apples sizzled in thick caramel-colored syrup. 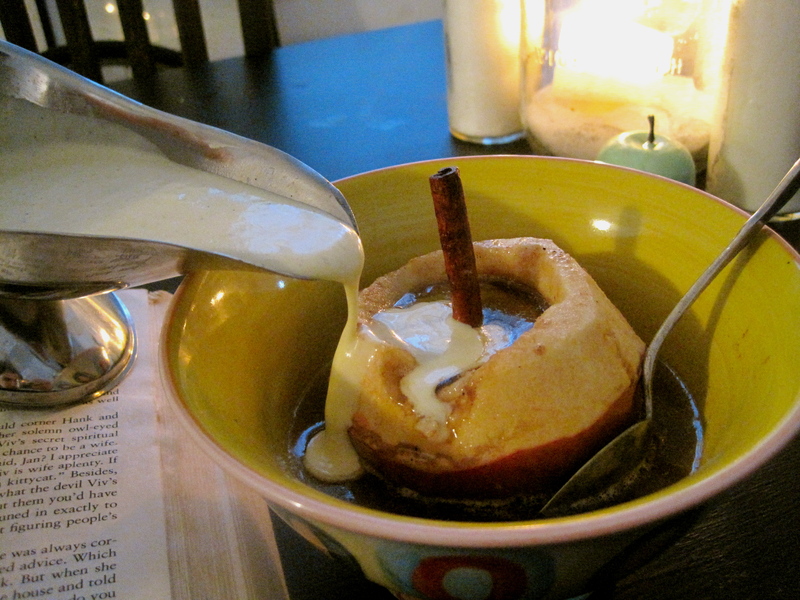 As intrigued as I was by the notion of adding Red Hots candies to my baked apples I couldn’t quite stomach it, so these apples get a cinnamon stick instead. 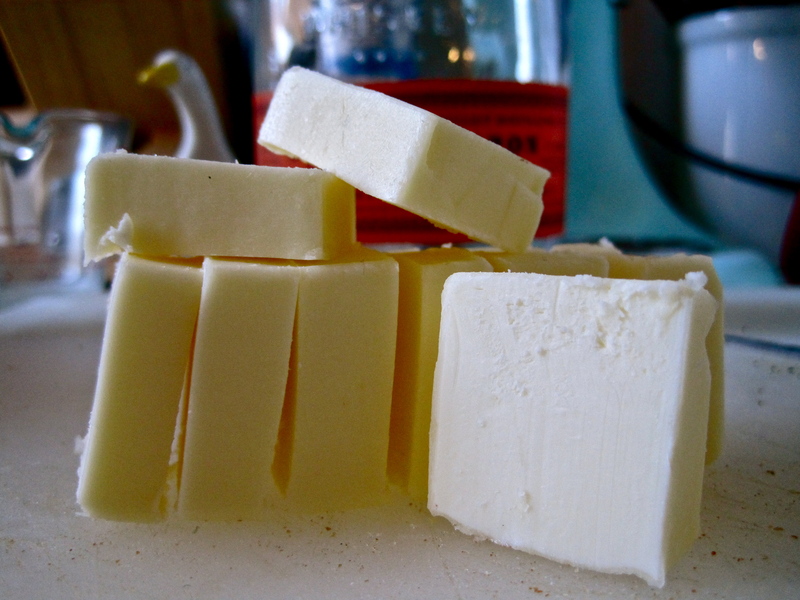 Viv’s pad of butter gets browned within an inch of burning and mixed with maple syrup, dark brown sugar, and a little bourbon to take the edge off. 4 baking apples (I used Rome apples but you can also use Golden Delicious, Cortland, Ida Red, Jonathan, Macoun, Winesap, or any other apple with a sturdy skin and good tartness). In a medium saucepan brown butter until it is a very deep amber color and gives off a nutty aroma. 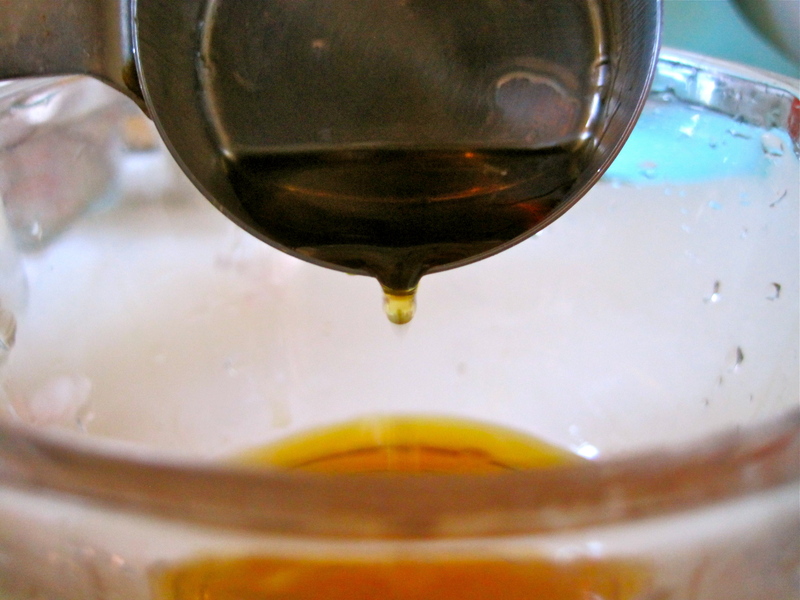 Mix browned butter, maple syrup, bourbon and salt together and whisk until emulsified. Put in the refrigerator to cool and solidify. Meanwhile, peel the top 1/3 of the apple. 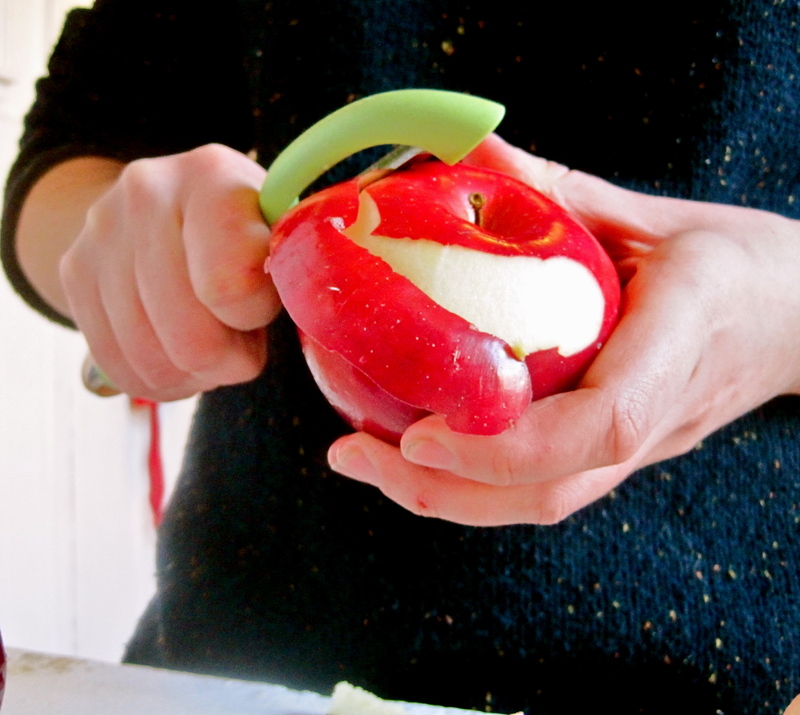 Using an apple corer or melon baller remove the apple’s lid. Pluck out the stem and replace with a cinnamon stick. Set aside. Scoop out core from apple, being careful not to dig all the way through to the other side–you want the bottom to stay intact to hold all of the ingredients in. Once the butter mixture has set mix it up with 1/3 cup dark brown sugar and scoop it into the apple hollow. 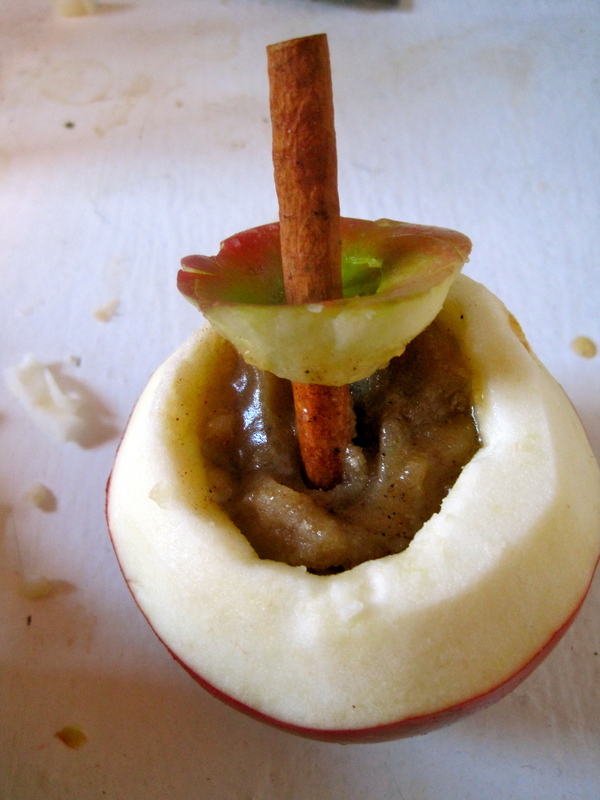 Place the lid on the apple, making sure the cinnamon stick is buried inside of the brown butter/brown sugar mixture. 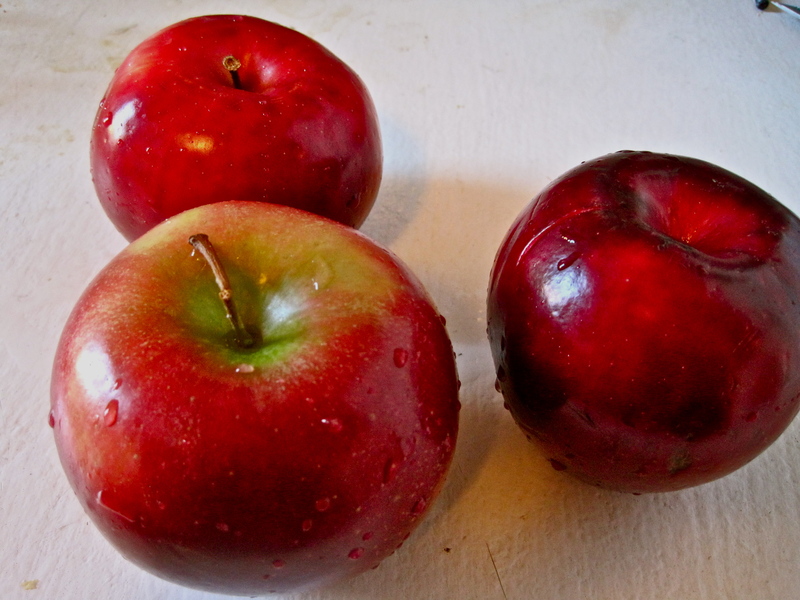 Place apples in a baking dish and cover them 1/3 of the way with apple cider. Bake at 350 for about 40 minutes, or until tender, basting with apple cider every 10 minutes or so. While the apples are baking, prepare the custard sauce. Before you start, make an ice bath and set it aside, also have a fine mesh sieve handy. 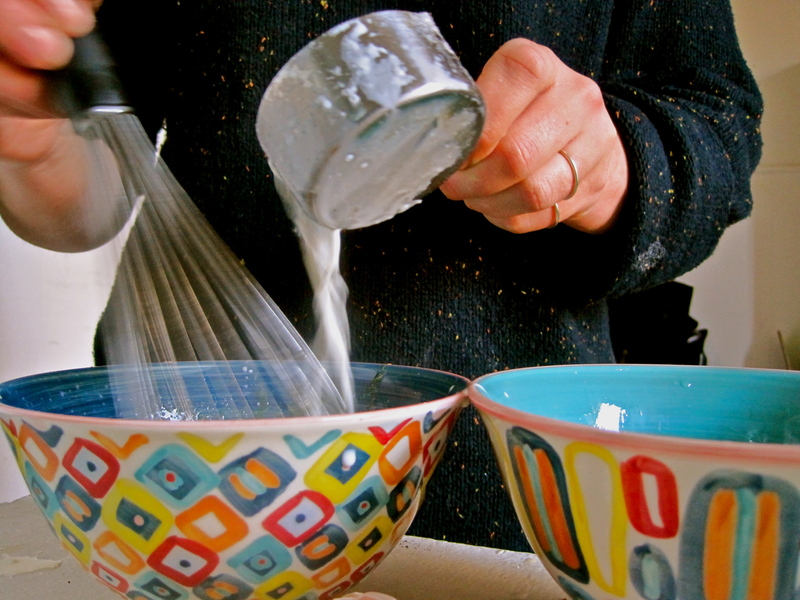 Pour cream into a medium saucepan. Split vanilla beans lengthwise, scrape the seeds from the pods and add both seeds and pods to the cream. Heat cream until just before boiling. Turn heat off and allow vanilla beans to steep while you separate your yolks. 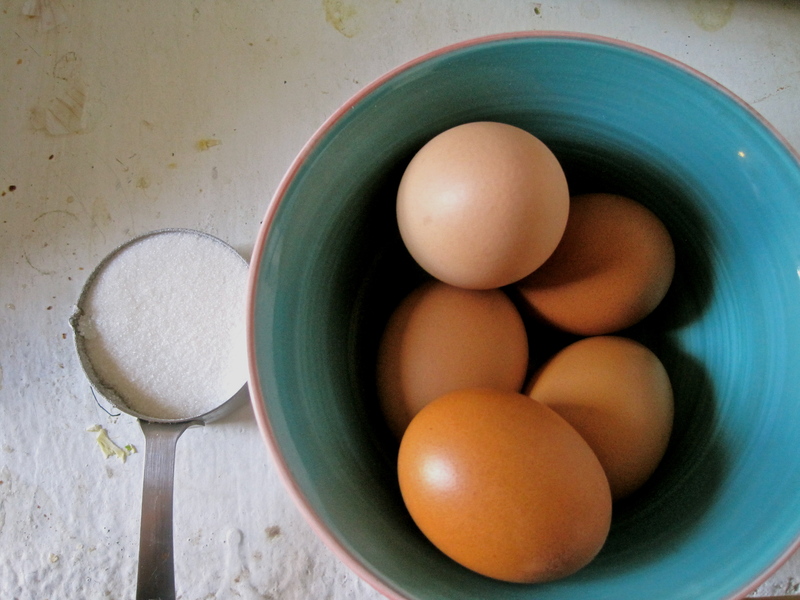 Once yolks are separated add sugar and whisk together. 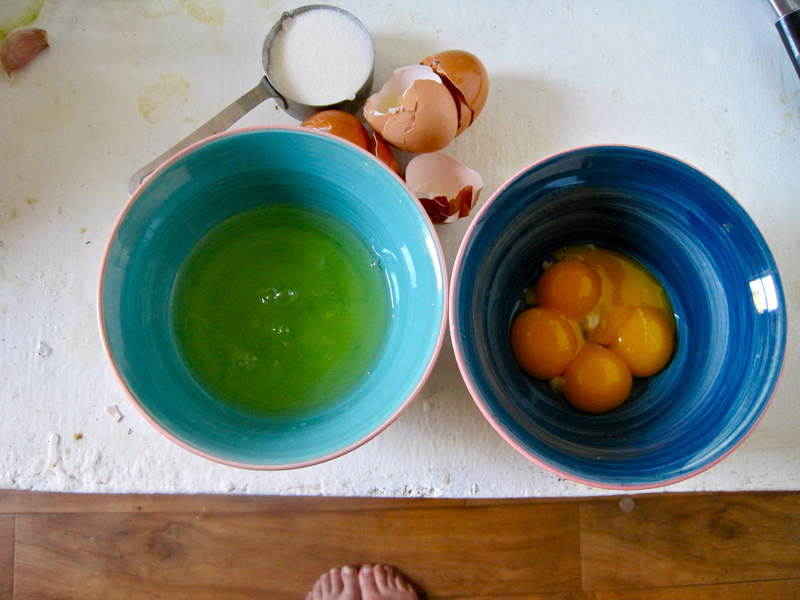 Temper yolks with cream, pouring the hot cream into the yolks in a slow steady stream and whisking constantly. Pour mixture back into sauce pan and cook over medium/low heat whisking constantly until the mixture thickens and coats the back of a wooden spoon without running (if you have a thermometer it should be at 80-82 degrees celcius at this point). 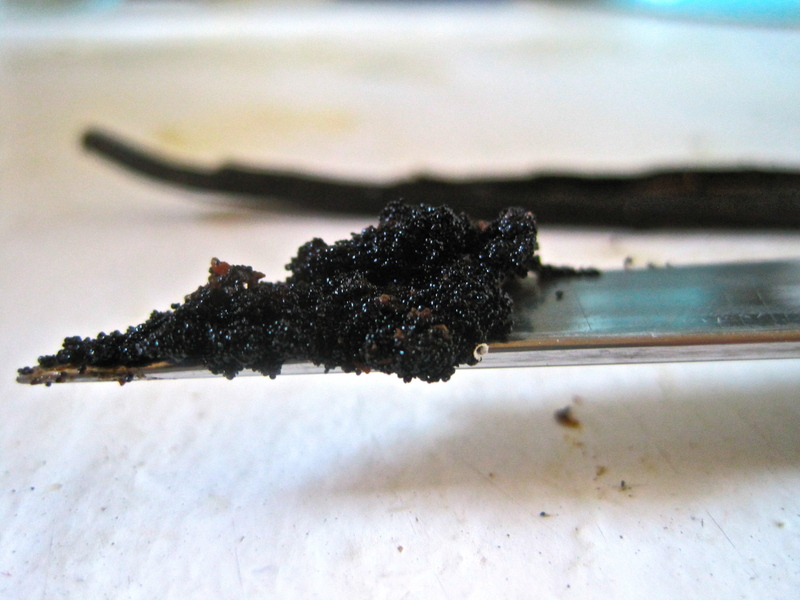 Remove from heat and strain into a bowl through a fine mesh strainer. Place bowl in the ice bath and whisk mixture until cooled. Set aside in refrigerator until apples are ready. 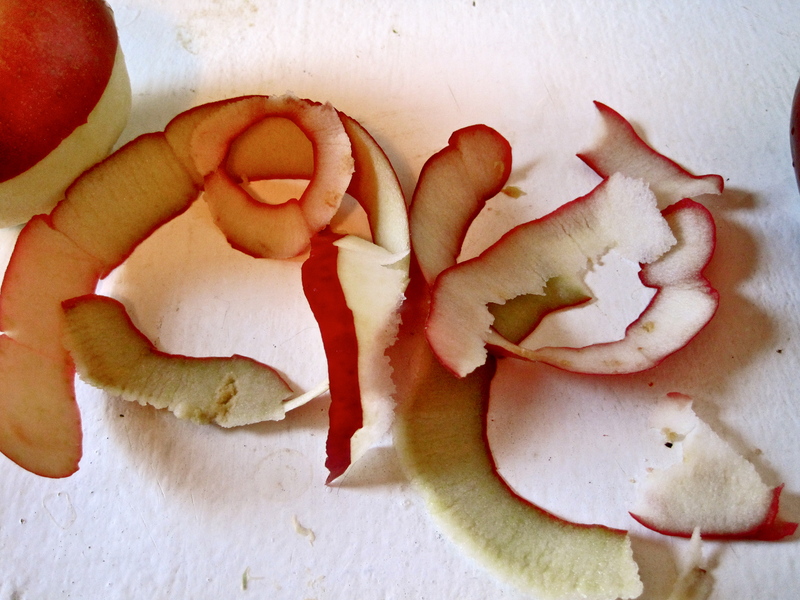 When apples are done, transfer them into individual bowls. Pour the pan drippings onto each apple and then cover in vanilla custard sauce.